The Iditarod Trail Sled Dog Race defines what it means to live in the Last Frontier. As the most popular sporting event in Alaska, the “Last Great Race on Earth” pushes mushers and their furry friends through the most majestic landscapes and perilous conditions to ever exist. If you’re living or working in Alaska this year, taking part in the festivities of the Iditarod is a once-in-a-lifetime opportunity. With over 1,049 miles of treacherous trail stretching from Anchorage to Nome, picking the perfect vantage point to spot the sleds can be hit or miss. Since you don’t want to be left out in the cold with nothing to see, here are a few notable spots to view the Iditarod Trail Sled Dog Race. Furry Fact: Each team must have a minimum of 12 dogs (and a maximum of 16 dogs) on the line to start the race. At least six dogs must be in harness when crossing the finish line. The best place to view the 2011 Iditarod Trail Sled Dog Race is at the ceremonial start point on March 5th in the middle of Fourth Avenue in downtown Anchorage. The event begins with a ribbon-cutting ceremony as an honorary musher starts the race at 10:00 AM through the streets of Anchorage. The first true competitor leaves the gate at 10:02 AM, and the rest of the competing mushers follow, separated by two minute intervals. Furry Fact: Original sled dogs were Inuit Sled Dogs bred by the Mahlemuit tribe, but Siberian huskies later become the most popular racing breed in the early 20th century. Today, modern race dogs are mix-breed huskies (45 – 50 lbs.) bred for speed, attitude and desire to run. Iditarod Tip #1: March temperatures in Anchorage traditionally hover around freezing, and as a precaution, race officials barricade five-blocks of downtown Anchorage and cover the streets with extra snow shipped by dump trucks the night before the race. Due to the combination of inclement snow conditions and the fact that this is the only part of the race to go through an urban area, competitors are encouraged to move at a relaxed pace as the Anchorage checkpoint does not count toward the official race time. Furry Fact: Iditarod sled dogs burn roughly 11,000 calories per day. Based on body size and weight, this amount of caloric burn is eight times the amount of a Tour de France cyclist. This is by far the most popular viewing checkpoint of the race, as thousands of spectators lineup along Fourth Avenue. If you’d rather not battle the crowds at the starting line, try standing along Cordova Avenue where many race rookies are known to take a spill along the hard right turn. Furry Fact: Eight booties for each dog are required in the sled (or in use) throughout the race. The race restarts the following day 30 miles from Anchorage in Willow. Since 2004, the restart time has moved from 10:00 AM to 2:00 PM to allow the race to begin in colder weather. Since the first mushers will arrive at the Skwentna checkpoint well after dark, fans are discouraged from flying into the next checkpoint. Furry Fact: Sled dogs must be fed a high calorie, high protein diet. A musher aims to find food that is 2,500 calories per pound, typically made from lamb, moose, poultry or corn oil. Food is given several times throughout the day, and can be supplemented with vitamins. 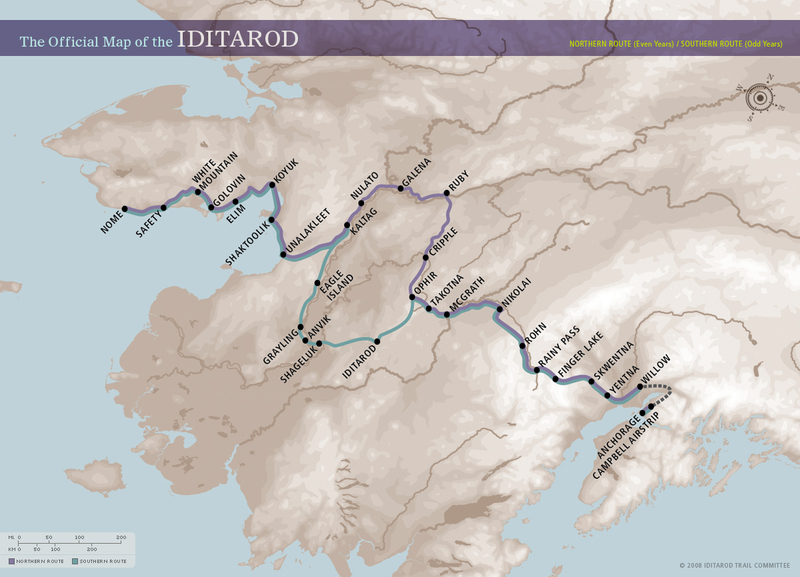 If you’re a diehard Iditarod fan, or if you would like to participate in the Willow or Skwentna checkpoints, there are many Iditarod volunteer opportunities available through the Iditarod Trail Committee. Iditarod Tip #2: Unless you live around these parts, it’ll be hard to see these checkpoints unless you’re traveling by airplane. In fact, the 65 mile leg from Iditarod to Shageluk has no human habitation for the entire route. Much of the area was burnt down during a forest fire many years ago, and all that’s left are a series of 13 rolling hills that expose mushers and their dogs to the frigid elements. Furry Fact: Iditarod dog training starts in the early summer. Many competitive teams run over 2,000 miles in training before the race, and use wheeled carts to simulate the sled when there is no snow. Want to see what ten days and nights of frosty, winter sled dog racing will do to a person? Check out the Iditarod finish line in Nome. Mushers turn on the afterburners and their furry athletes rocket to the finish line on Front Street under the Iditarod Sled Dog Race arch. Iditarod Tip #3: Since each racing team begins the race with a staggered start time, the first team to finish isn’t always the winner. This can make for an anticlimactic finish and an all-day waiting game for many of the spectators. Furry Fact: in 1973, the Iditarod winning time was 20 days, 0 hours, 49 minutes, and 41 seconds. Nowadays, the last competitor can complete the course in under 13 days. This is a result of lighter sleds and advanced sled dog conditioning. 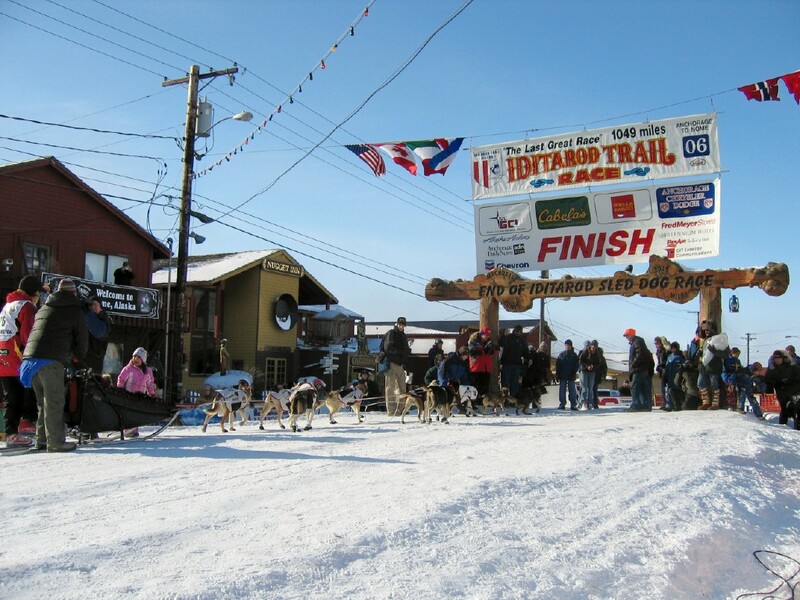 Since most of the leg from Safety to Nome is exposed to the elements, Nome natives recommend two main viewing areas for the finish line: The world famous Nome Nugget Inn sits at the Iditarod finish line and offers a seating area and window front view to the action. For a less regal viewing party, visit the Subway sandwich shop located on the opposite side of the finish line. It’s a little further away than the Nugget Inn, but on a cold day a warm building with large windows and a $9 foot long is all you need. The Subway sandwich shop is also the best place to view the Red Lantern driver. Iditarod Tip #4: The last musher along the race receives a red lantern from race officials when the team reaches Front Street. Once the driver reaches the arch, he/she must go up to the Widow’s Lamp, a lantern that has been burning under the arch since the beginning of the race and extinguishes it. This indicates the end of the race, and that each musher and team member has reached the end of the trail safely.